Scarlett Reverie: No one is racing: Tonner "Dressed like Racehorses"
No one is racing: Tonner "Dressed like Racehorses"
Woke up and jumped out to check the new Tonner Racehorses. Clicked on site. Hoped they got it right. Not jumping up and down. Ended up with a frown. Not a good photo. Not enough seen on the site. Tonner seems to be rushing. And no one seems to be racing. Pricing seems good though. That's all. Pardon the little poem. I'm no poet and tried cracking one for this post. Well, with all that's been said and said in the Scarlett group, all of which are very agreeable, I still feel that I will have this outfit. The Franklin Mint version is sooooo elusive, and its feels like "ducks on a june bug" whenever the Franklin Mint New Orleans Honeymoon dress is posted in eBay. Last night a series of email exchanges in the group reflected the yearning for re-interpreted versions or new versions of GWTW dresses and so it seems that if it doesn't surpass the existing, or isn't a delightfully new one, then it falls short of expectations. Thanks to Nikki who enlightened me on what dress supposedly would come out. She can recall lines easily from GWTW. Amazing. "Dressed like Racehorses" was a line that the great Mammy would describe Scarlett and Rhett i.e., that they would be dressed like racehorses but be mules just the same. 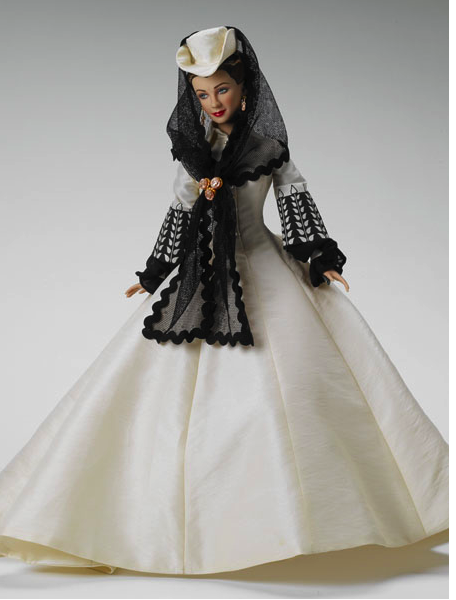 And to Dale Ohl of Lonestar Dolls who tipped me on the soon-to-be-released Tonner GWTW. Labels: Tonner Scarlett "Dressed like Racehorses"
I was disappointed to learn that this is the next Tonner outfit. Been there...done that...and better before. Ugh. Love the new name of the blog! Yes Dave. I think people were expecting something interpreted better. Although we know that often the press release photos differ a little from the real one, I was expecting a 2010 BANG. Maybe that big thing is yet to come. Meantime, Franklin Mint has been coming up with great interpretations to the last detail. And they're ever more putting more attention to hairstyling -- which Tonner is not able to come up to, sadly. Looks like Tonner is foundering in direction when it comes to Scarlett; the whole "lost costume" idea kind of fizzled, and now they seem to be playing catch up to Franklin Mint by trying to re-do already done outfits. Why not the New Orleans Honeymoon outfit? It's never been done and what a cool one that would be! Or the beautiful blue robe with fur trim that Scarlett wears during Bonnie's fatal pony ride? I'd like to think Tonner has a little more creativity than to just produce second-rate rehash, but so far, it's not looking that way. And yes, I believe Gene has hit the end of the line. I can understand Mel Odom being burned out with Gene and wanting to explore other paths. Personally, I'm okay with it. I'd rather her leave on a high-note. I do have a feeling though that down the line in a few years, Mel might do a special edition or something else if the demand continues. Already, ebay prices are creeping up for Gene.